Thank you to Mrs. Tanenblatt for hosting this link party. First, I'd like to show you my desk as it was on the night before school started, July 28, 2014. It looked really nice back then! As you may have guessed, December is a crazy busy time for musicians and music teachers. This week is my busiest, with 2 major performances. Next week tapers off with only one field trip performance, the 2nd graders will be singing at the Children's Hospital. I try to use shelves, drawers, and file folders, but it always seems that my brain works best when things are organized in piles! The first thing you can see at the bottom left is my instrument inventory list. Now who asks music teachers to do an inventory that is due in December? Oh, that would be me! In my assignment as lead elementary music teacher, I had to ask all of my colleagues to finish their inventory before winter break. In all fairness, the district property person's original due date was Sept. 30, but that has been pushed back several times until....NOW! I hope we can all get them done, but it has been a little challenge. Further down the pile you can see the Carnegie Hall Link Up curriculum guide for the Orchestra Rocks. We have been fortunate that our local symphony has linked up with Carnegie Hall because this is a great program. It has made the young people's concerts much more interactive, and even the classroom teachers are now impressed with them. My 4th graders began their recorder lessons in October, and we will have to hit the Orchestra Rocks songs pretty hard in January. The yellow and white papers at the bottom are drumline cadences, printed from www.freedrumlinemusic.com. This is a site full of just what the url says, free drumline music. I have found several simple pieces that I am using with my 5th grade bucket drummers. This computer is connected to my new SmartBoard! It still seems to have some kinks. I'm not sure if it is the new board, or the old computer, but I hope to get that troubleshooted next week. I really am loving the fact that I have a mounted projector and I don't have to trip over wires, or arrange seating so kids can see around the projector cart! On top of the computer, on bright green & gold paper so it doesn't get lost, is my script and rehearsal schedule for the winter concert. The stack of green papers on the right are the student attendance commitment forms for the evening concert. The pink square contains a sketch of a hot air balloon that I gave to my art teacher colleague. She is awesome, and turned that little scrap of paper into a giant hot air balloon for the concert backdrop. Our theme for this year's concert was Dream BIG! 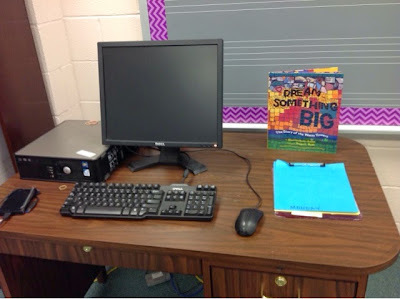 This coordinates with our school-wide them book, Dream Something Big, that you see on the back corner of my desk. The book tells the story of the man who created the Watts Towers. The concert include the entire 3rd, 4th & 5th grades, and went off with only a minor glitch or two and I am very thankful that it is over! I am definitely looking for something a little more low key for next week. Jena Hudson's Winter Listening Glyphs will be just the thing! I have printed out the mitten page, and it is ready to take to the copy machine. 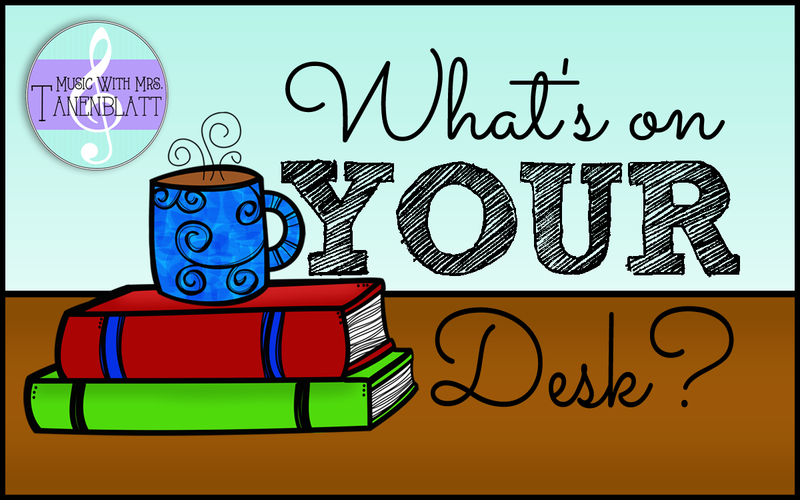 Of course, there always seems to be a few extra things on the desk! My Nutcracker is tucked in the back, in use during many lessons this month. Under the monitor is a birthday card to me. It was an especially nice surprise because we haven't been too great about acknowledging birthdays at my school. Morning coffee mug, afternoon water bottle, well used pencil cup, and a bright pink scarf. All necessary in the daily life of a music teacher! Thanks for taking the tour of my desk. I'm looking forward to cleaning it off again next week. I hope to start January off with it looking more like picture #1! Thanks to Rachel for hosting this linky party. 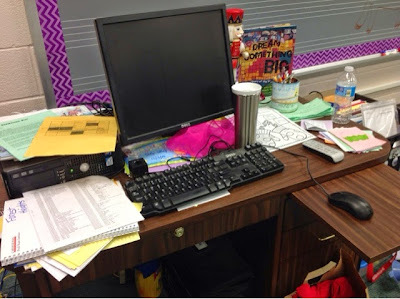 Be sure to visit her blog by clicking on the "What's on Your Desk" picture above and check out the other music teacher desks! I love the before and after pics! Glad to hear that your concert went well... It's almost time for some hard-earned vacation time!